Communicating to others about Health at Every Size® (HAES) can be complicated. Many of our clients have said it feels like they are speaking a different language. You may have had this experience too. Talking about an approach that lives on the other side of widely accepted weight stigma is a massive paradigm shift, and finding the language to communicate about it is foundational in our personal evolution, and in the evolution of this movement. The same complication comes up for HAES providers when they want to communicate their work to the public. How do you capture and share the essence of this paradigm shift when it feels counter-culture? It can be tempting to “meet your clients where they are at” and engage them through shame-centered motivation that has been utilized by the competing forces of the weight loss industry and dieting culture. It can also complicate things when the dieting industry is beginning to co-opt “body positive” language to sell weight loss. Thanks Special K and Weight Watchers! We know, as HAES practitioners, that using this approach causes harm. After 10 years of working together to offer an alternative to the traditional weight paradigm, we can now see how the development of our language was directly tied to our deepening and evolving relationship with this movement. The language we share with others reflects the depth of respect we have for their lives and bodies. Often it has directly been sourced from our own acceptance, the deepening and widening of trust in the bodies of the people we serve, and the lessening of a need for our own experiences to be the place where we try to explain the experiences of others. This is another way of saying that learning to talk about our work has been humbling, to say the least. We’ve blown it, using language we later regretted, often finding blind spots living in both our white, cis privilege and in our growing experience. We believe there is a high cultural cost to using weight or body shame to motivate people to purchase something. The words we use are part of this social movement towards wholeness, body respect and acceptance. In our experience, our clientele are interested in concepts related to healing, feeling whole, and included. This is because our marketing is kind, compassionate and consistent with the work we do and the voices of the people we have been lucky enough to serve. What does this look like? We avoid creating a sense of scarcity or speaking to lack. No bait and switch. No dumbing down to “fit-in” with dieting culture. Kelly Diels is researching an insidious marketing narrative that she has named “The Female Lifestyle Empowerment Brand” This style of marketing “doesn’t just show women what they should look like, it instructs women in who they ought to be and what they ought to do” says Diels. This narrative, rooted in lack and constant striving, lacks attention to social justice realities that inform people’s lives. Diels created a list of egregious internet marketing no-no’s that highlight commonly used marketing techniques that frequently translate into scarcity, fear and shame. The people we serve at Be Nourished often have one foot in the dieting industry as they seek information about this weight-inclusive paradigm. It is a radical move to consider an approach completely counter to practically everything they’ve ever learned about food, weight, and health. Our job is to shine the light on weight stigma, facilitate a conversation to unearth and examine long held beliefs about body size, and open the door to their own truth and lived experience. This takes time and support for most, not a quick sale of behavior changes or to-do’s, or the expectation that they must somehow “become better” than they have been. We aim to tell the truth about a healing process that is hard and rewarding. We are offering a paradigm for ALL bodies, but not one body more than another. We see, through our own development of language in our marketing, that our offerings have become deeper, richer and more rooted in respect and truth due to that effort. The deeper digging will benefit your work and business as a whole. The heart of this work is the complexity of it. The dieting paradigm is soulless and mechanistic. Our communications with the world, via our marketing, social media, websites, etc. can help steer this movement and assist us in collectively understanding what this inclusive paradigm truly embodies. This is another place to tell the truth and be brave, again and again and again. 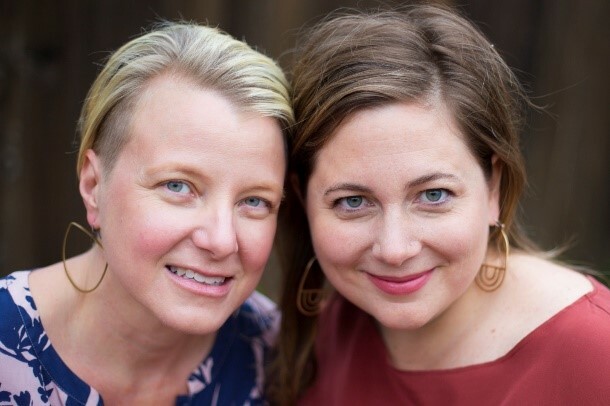 In 2006, Hilary Kinavey, MS, LPC and Dana Sturtevant, MS, RD co-founded Be Nourished, a revolutionary business helping people heal body dissatisfaction and reclaim body trust. Hilary is a licensed professional counselor, a Certified Daring Way™ facilitator, and a transformational workshop leader. Dana is a registered dietitian, Motivational Interviewing trainer, and Kripalu Yoga teacher. After many years of deep listening, learning, and working at Be Nourished, Hilary and Dana co-created Body Trust® Wellness, a curriculum to encourage movement toward a compassionate model of radical self-care to heal body shame and patterns of chronic dieting and disordered eating. From 2007-2012, Hilary and Dana were adjunct instructors for the Eating Disorder Certificate Program at Lewis and Clark College in Portland, Oregon. Hilary and Dana are popular speakers on topics such as Health at Every Size®, intuitive eating, and body respect in health care communities, and regular contributors to the Huffington Post. For more information, visit benourished.org.